I am very excited to have been chosen to be part of Festive Collective, the end-of-year exhibition at Reverse Garbage (where I source my coffee bags). I am working hard now on a collection of burlap items for the exhibition – these Christmas ornaments are part of it. The exhibition will showcase jewellery, soft furnishings, home wares, fine artworks, paper goods and gifts for the eco-conscious buyer. It kicks off on Saturday 24 November with an opening party that I am really looking forward to! 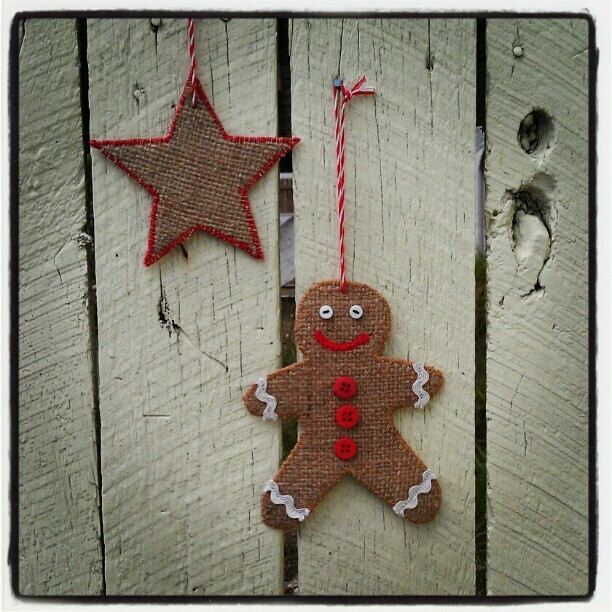 This entry was posted in Reverse Garbage, Upcycling and tagged burlap, festive collective, gingerbread man, star, upcycling on November 5, 2012 by bluejacarandadesign.